New Most Popular! 20 oz. 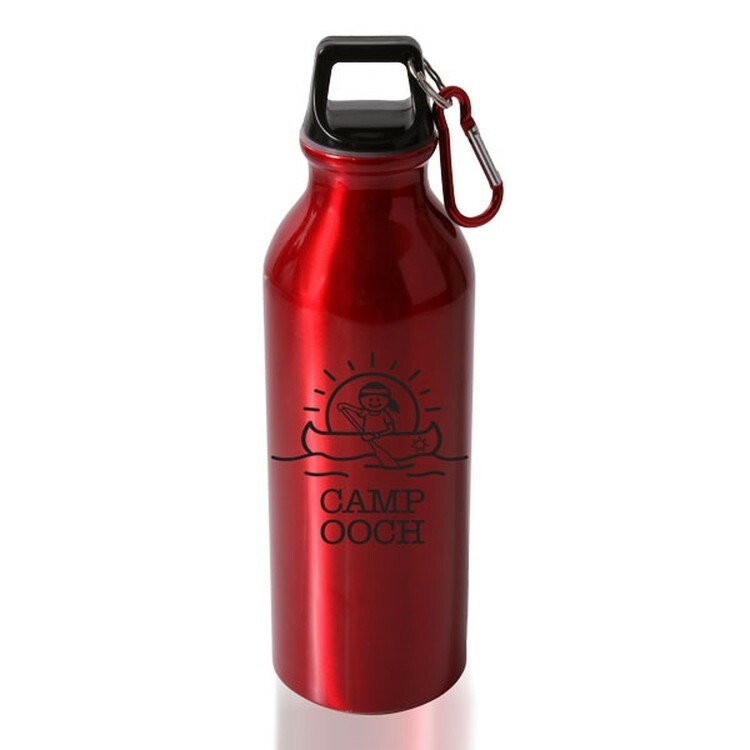 Aluminum Sports Bottle with Carabiner. Sold with black screw on lid. Ships Assembled - no extra charge. Lightweight 24 oz. 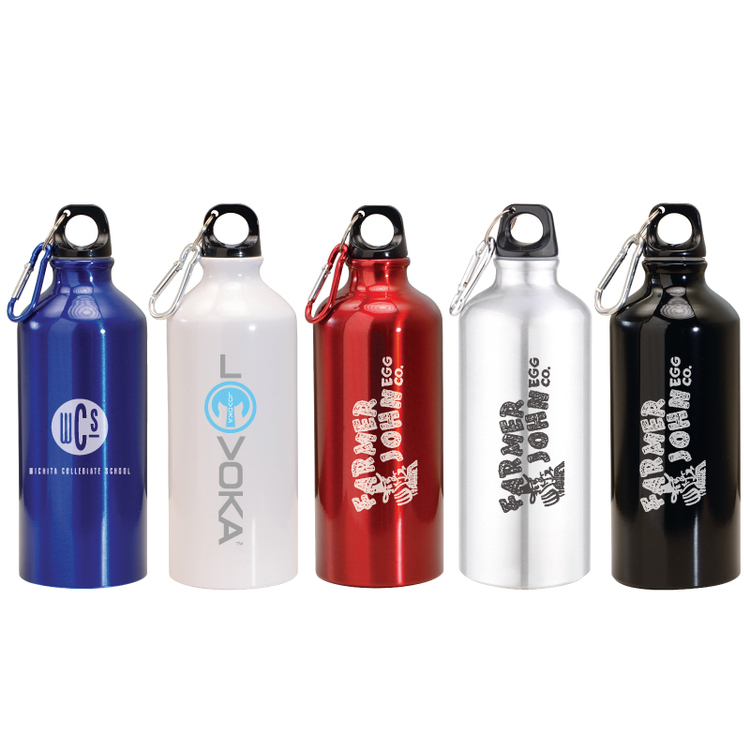 aluminum water bottle resists shatter, stain and odors. Screw-on leak resistant lid. Includes carabiner for easy transportation. BPA Free. 24 oz. Lightweight 20 oz. 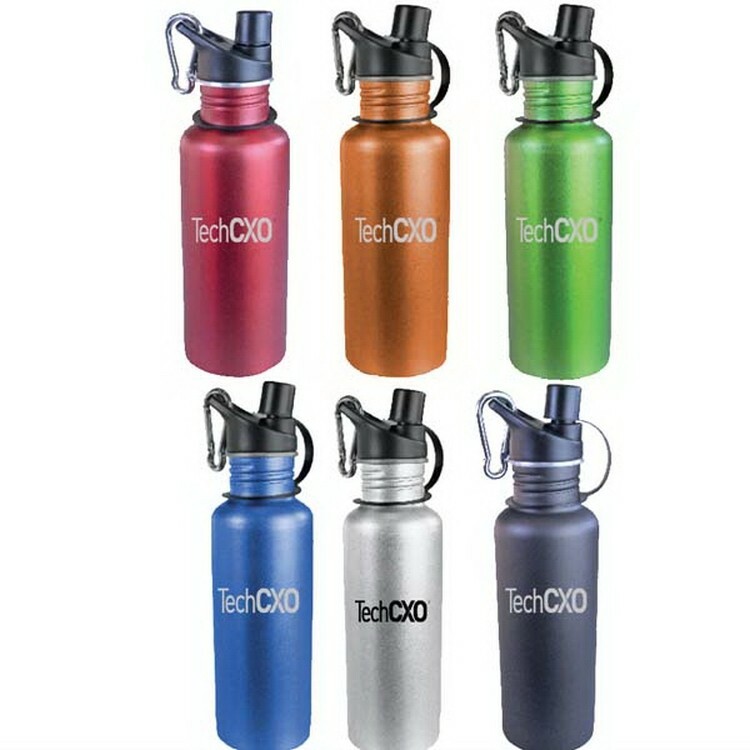 aluminum water bottle resists shatter, stain and odors. Screw-on leak resistant lid. Includes carabiner for easy transportation. BPA Free. 20 oz. Lightweight 20 oz. 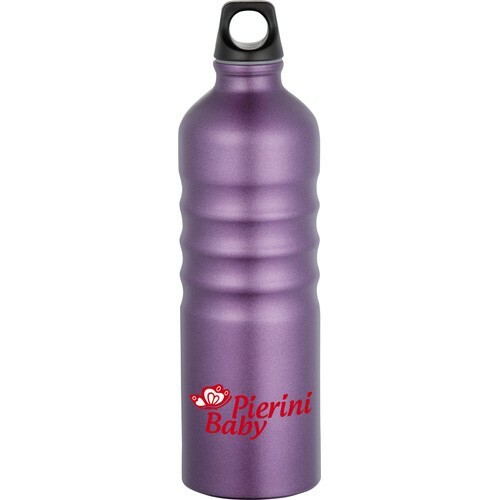 aluminum water bottle tumbler resists shatter, stain and odors. Screw-on leak resistant lid with finger loop. BPA Free. Lightweight 25 oz. 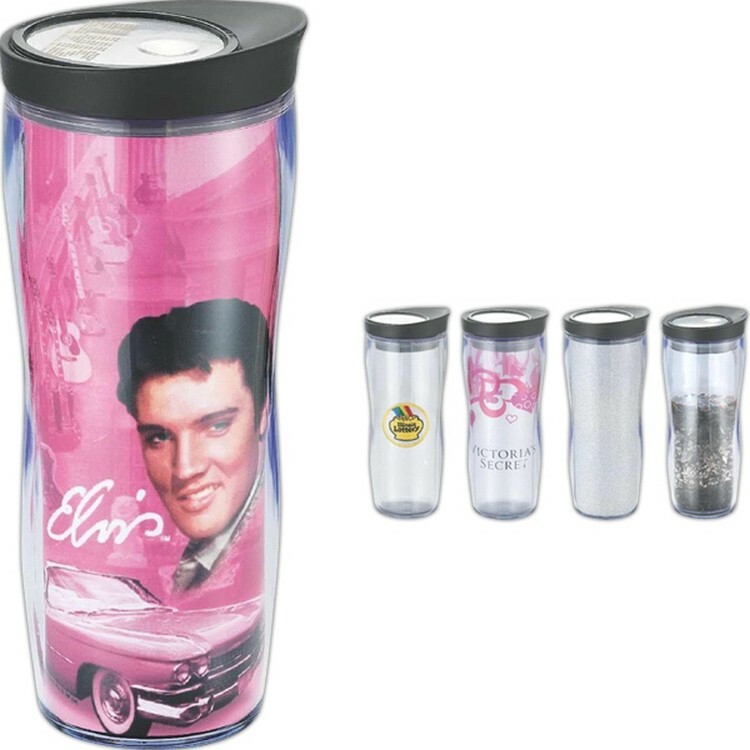 aluminum water bottle tumbler resists shatter, stain and odors. Gorgeous faded two-tone design. Features a valve cap with nozzle and straw. Screw-on leak resistant lid. BPA Free. Lightweight 20 oz. 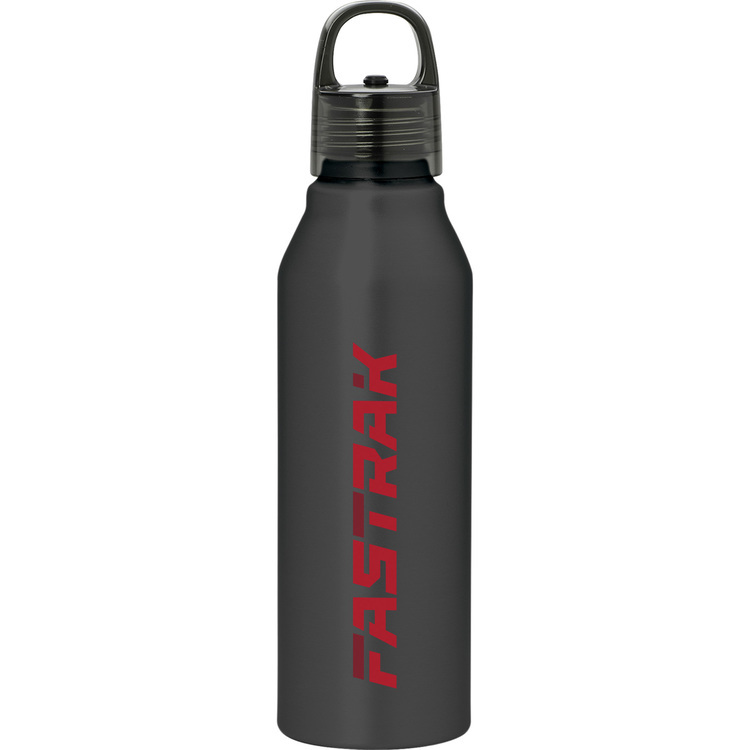 aluminum water bottle resists shatter, stain and odors. Wide mouth opening for easy drinking and cleaning. Screw-on leak resistant lid. Includes carabiner for easy transportation. BPA Free. 20 oz. 25 oz. Silver Trek Aluminum Sports Bottle BBA FREE. 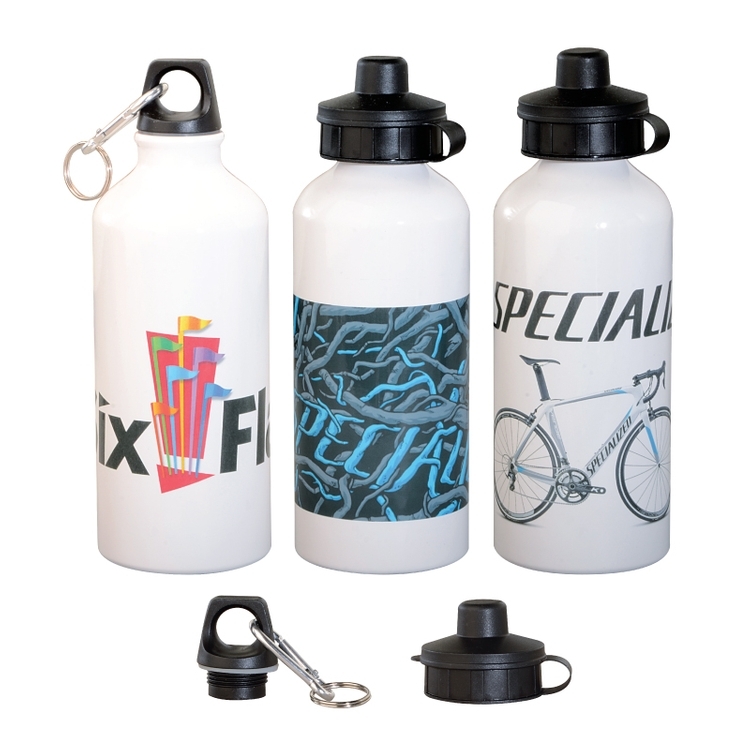 With everyone thinking about fitness, the promotional sports bottle has become a new best seller of personalized drinkware. The Trek is light weight and made out of the finest aluminum. It has a carabiner clip attatched to the lid for easy carrying. 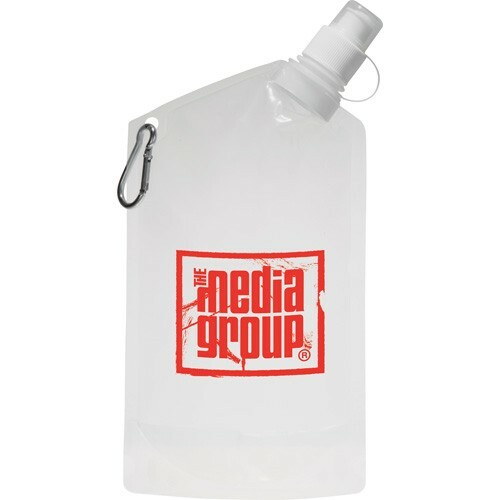 With its large imprint area, it truely is a stunning promotional item. 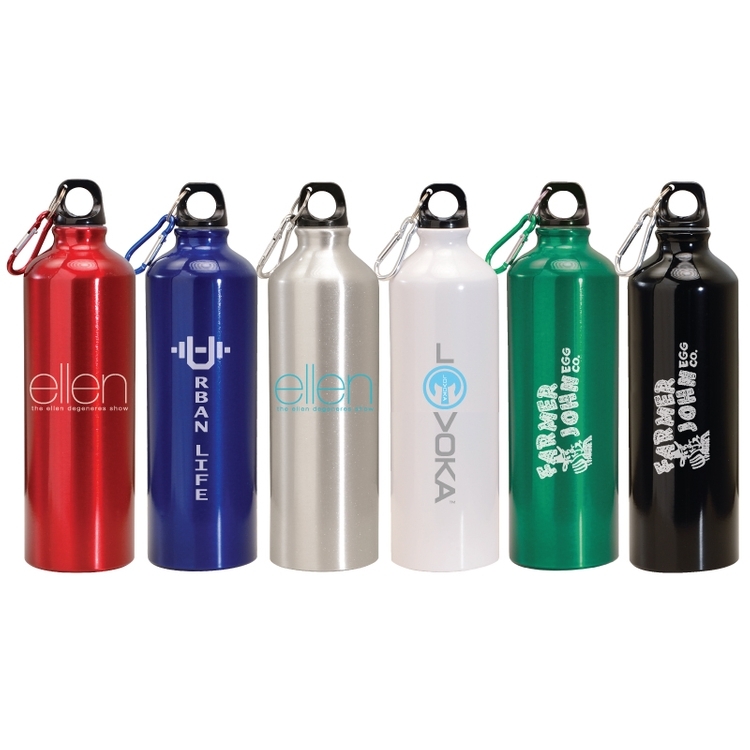 These sports bottles are great for giveaways, sporting events, parties and exercising. Available in Silver, Red and Blue. 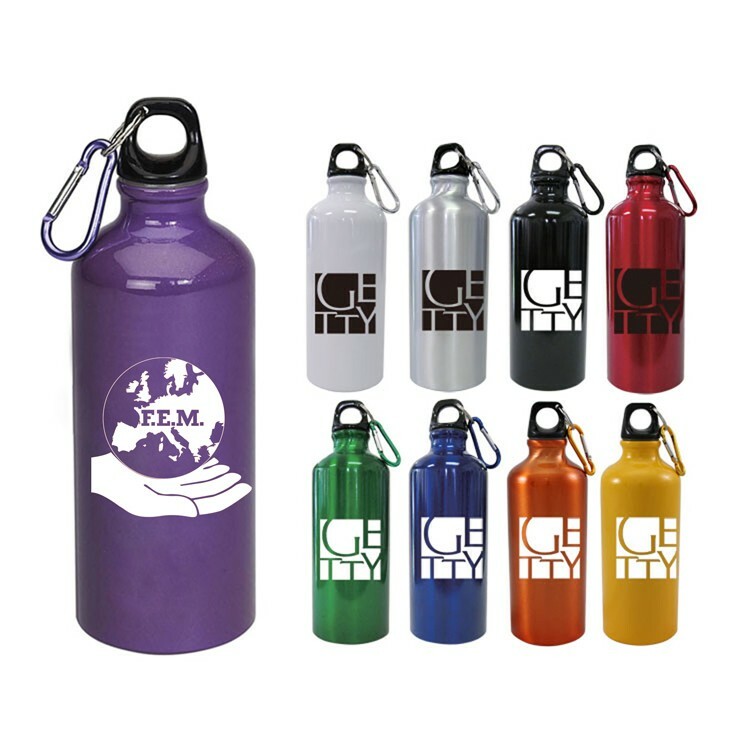 You will love the G-crew 24 oz Aluminum water bottle w/ Matching carabiner! It's available in red, green, blue and black and comes with its very own gift box. 25 oz. Red Trek Aluminum Sports Bottle BBA FREE. 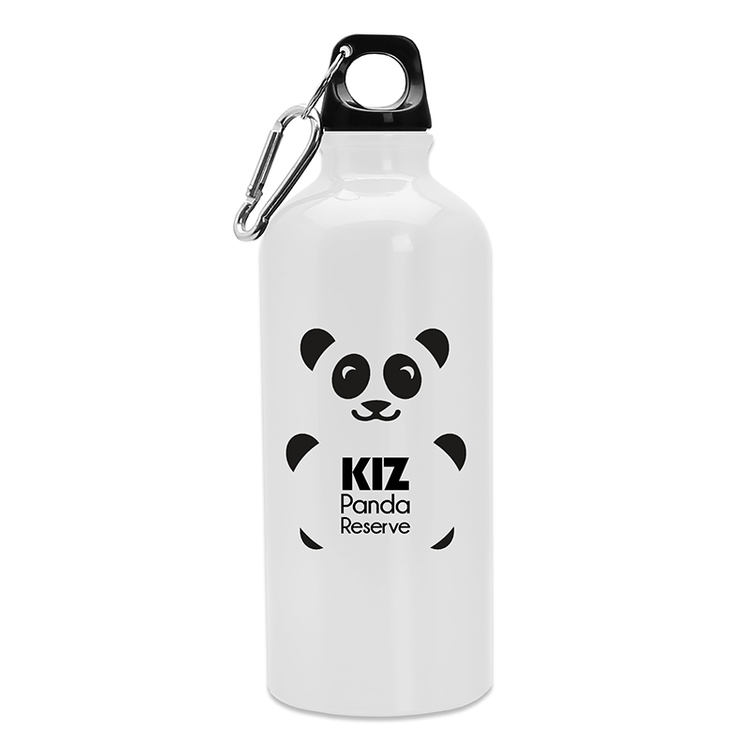 With everyone thinking about fitness, the promotional sports bottle has become a new best seller of personalized drinkware. The Trek is light weight and made out of the finest aluminum. It has a carabiner clip attatched to the lid for easy carrying. 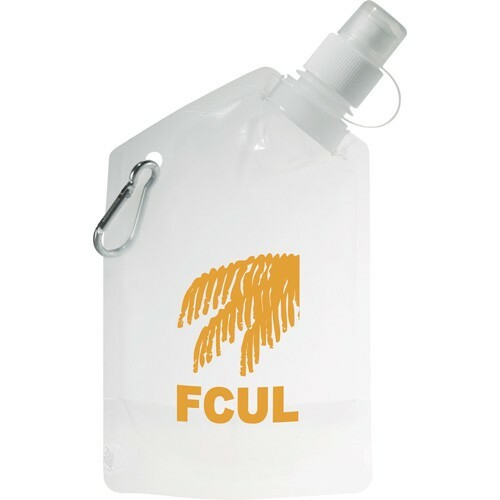 With its large imprint area, it truely is a stunning promotional item. 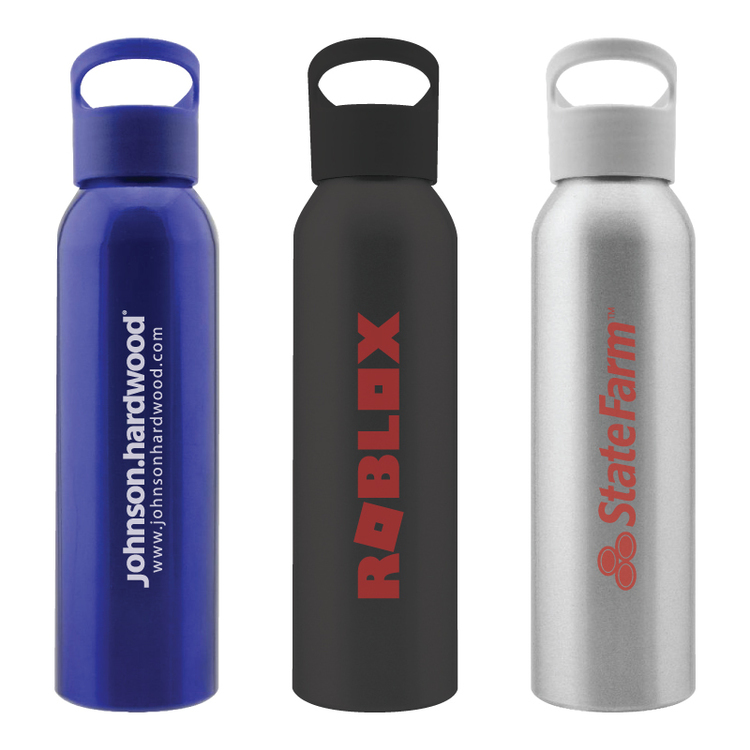 These sports bottles are great for giveaways, sporting events, parties and exercising. Available in Silver, Red and Blue. 25 oz. Blue Trek Aluminum Sports Bottle BBA FREE. 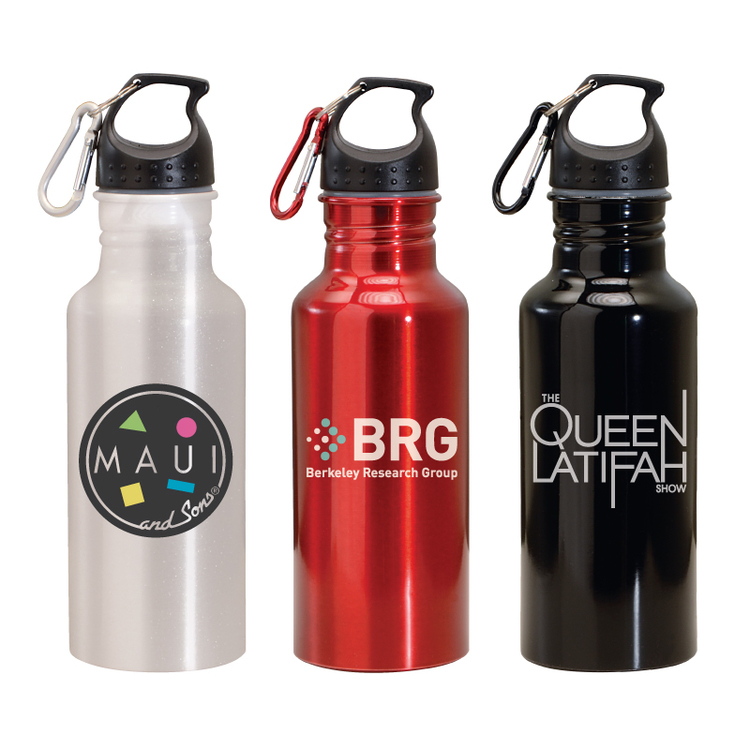 With everyone thinking about fitness, the promotional sports bottle has become a new best seller of personalized drinkware. The Trek is light weight and made out of the finest aluminum. It has a carabiner clip attatched to the lid for easy carrying. 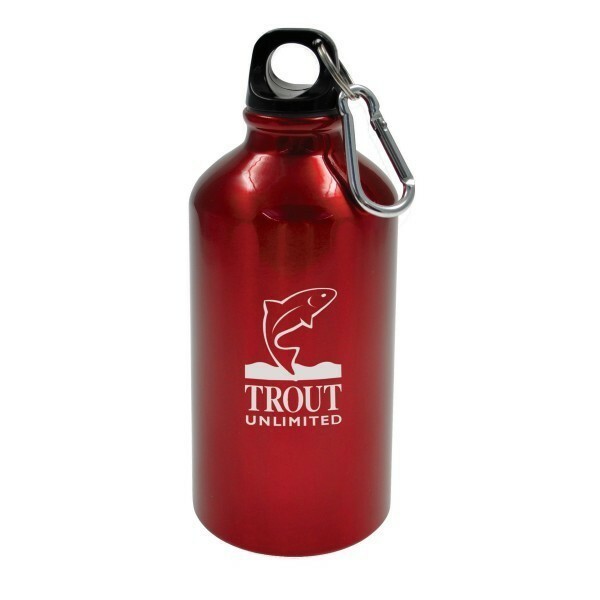 With its large imprint area, it truely is a stunning promotional item. 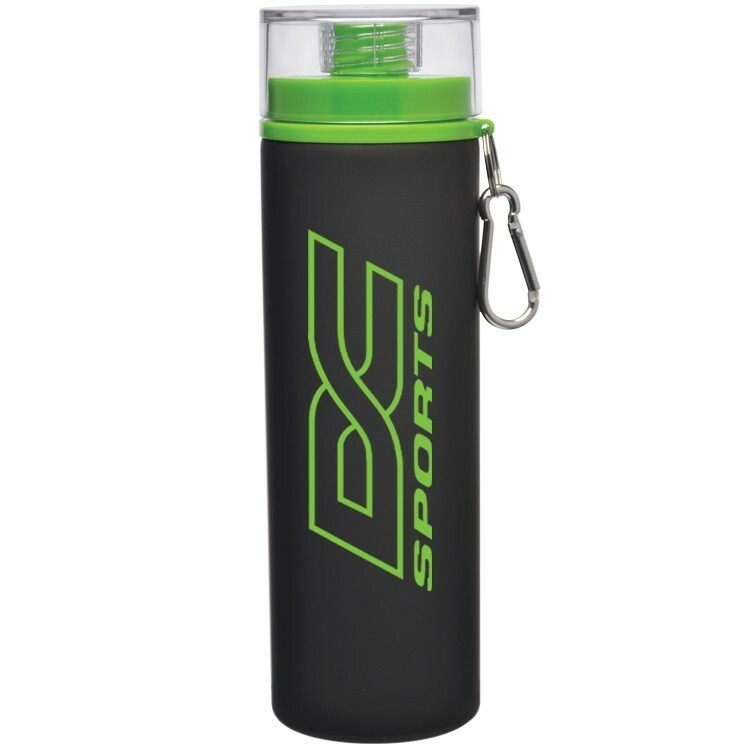 These sports bottles are great for giveaways, sporting events, parties and exercising. Available in Silver, Red and Blue. Lightweight 20 oz. 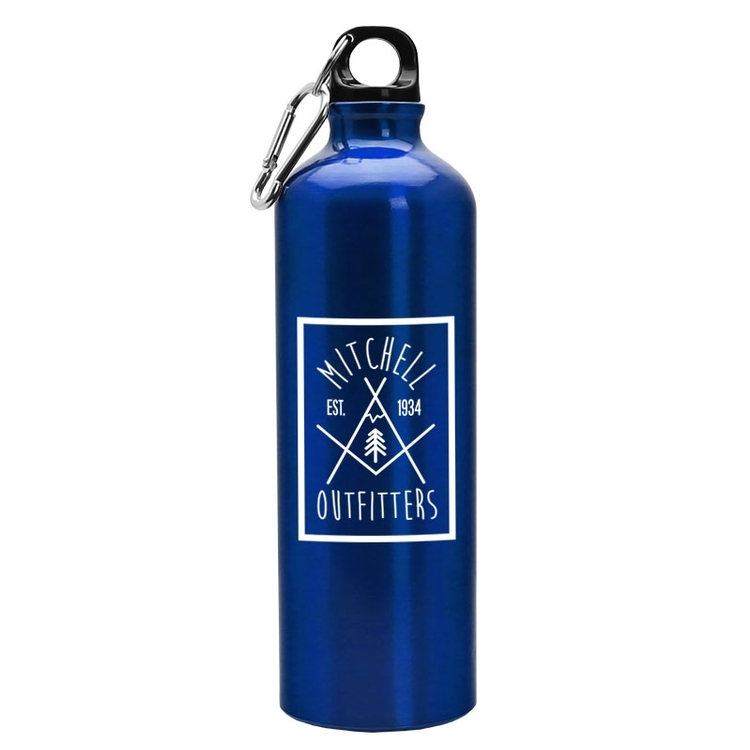 aluminum water bottle resists shatter, stain and odors. Screw-on leak resistant lid. Includes carabiner for easy transportation. BPA Free. Vivid full color photo-quality dye sublimation. The sublimation process is designed to produce a "pleasing" representation, not an exact match of the original colors. Some color variation is normal and to be expected. 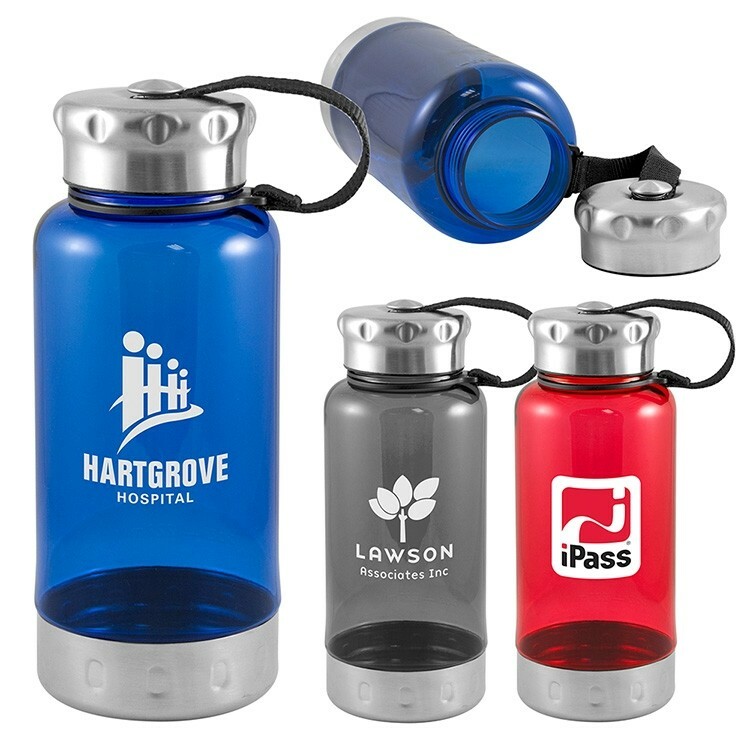 With a user-friendly sport cap and carabiner, the Artic sports bottle puts a refreshing twist on building brand awareness! This 24 oz. 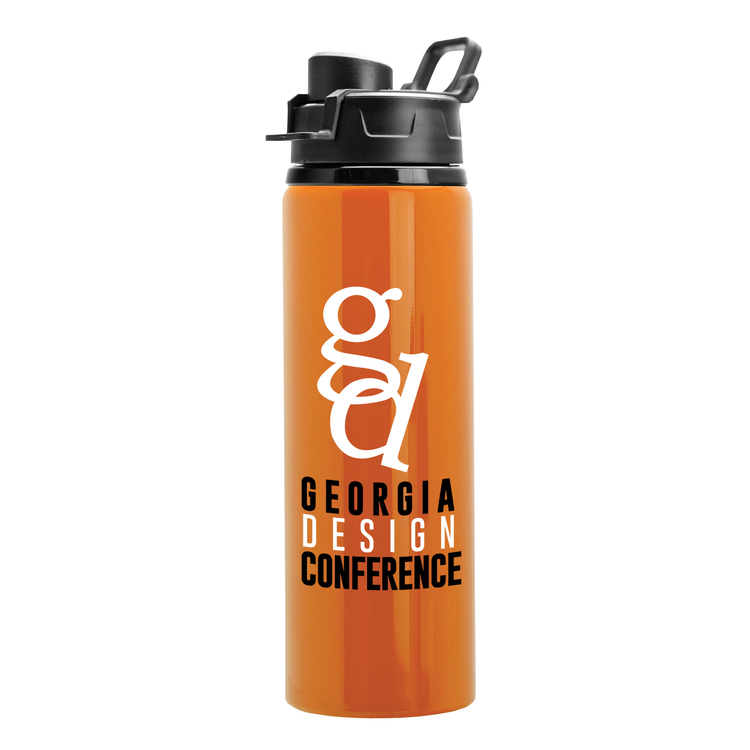 beverage container features an aluminum construction that's ideal for showcasing your company name, logo or personalized copy plus an opening that's wide enough for most ice cubes and cleaning brushes. Ideal for camping trips, charity walks and corporate picnics. A variety of bold colors available. Product Size: 10.75" H x 3" D.
34 oz. 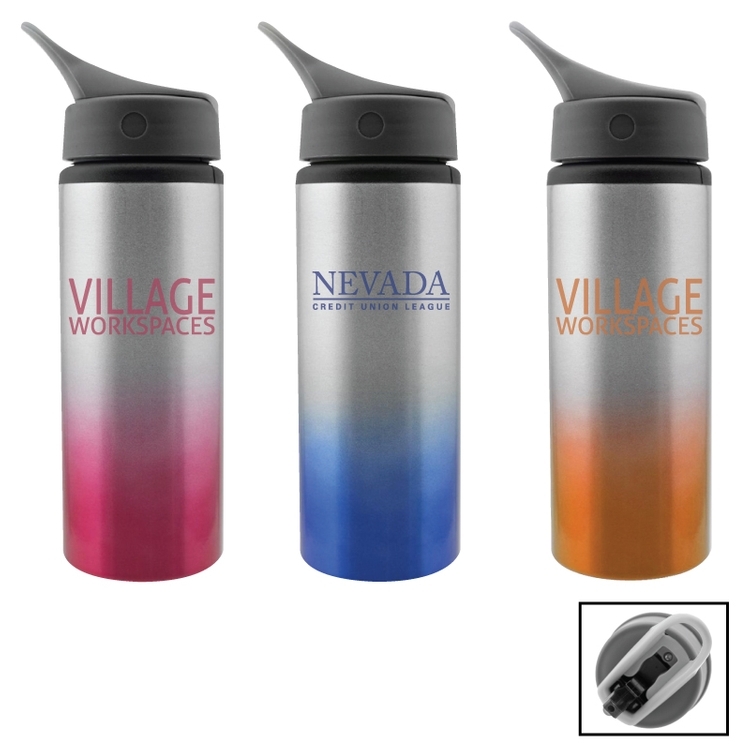 Tritan™ water bottle with stamped aluminum lid and base. Wide-mouth screw on lid with woven fabric carry handle. Molded measurement markers. Best for cold beverage, hand wash recommended, not microwave safe. 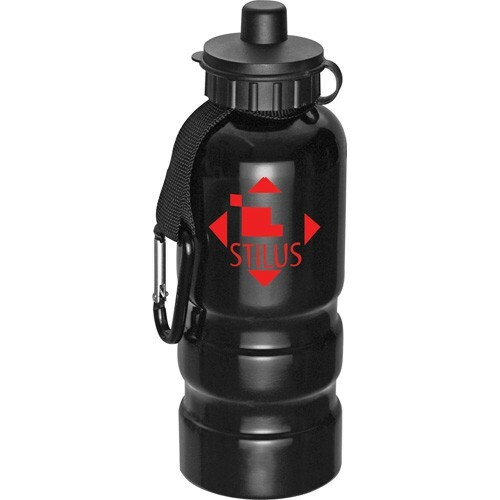 Make this Lunar Tumbler your next giveaway to get a jump start to success! It holds up to 12 oz. of your favorite beverage within its double wall acrylic plastic construction. It features a newly designed slide open / close aluminum disk lid making the design extra special. Imprint this with an optional etch logo to complete the look. This is a fantastic way to build up excitement around your business at the next event! If you want to type up a tremendous new promotional giveaway for the next campaign, look no further than this Gorilla Bluetooth keyboard! 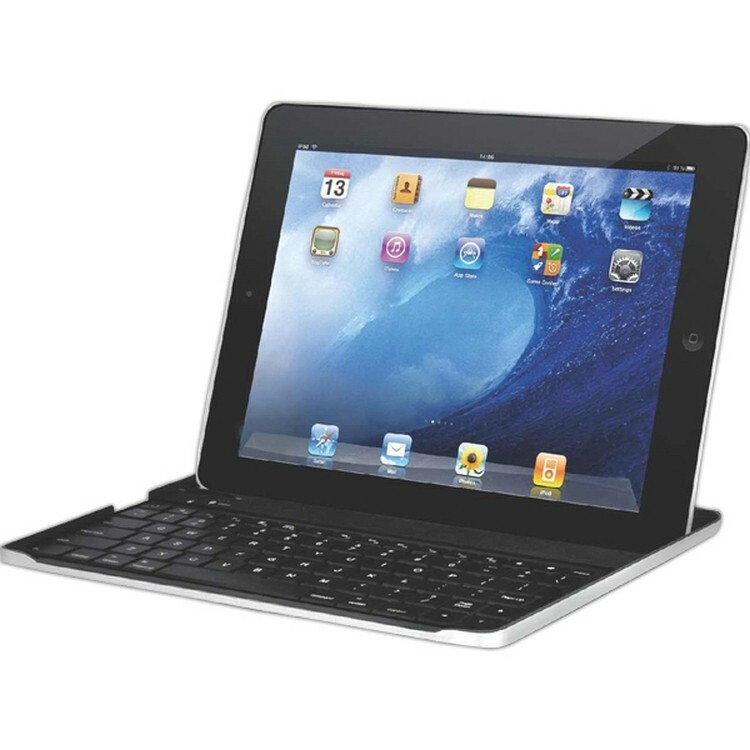 Measuring 9.5" x 7" x 0.38", this handy product features an aluminum design that is compatible with iPad 2. The large, flat base allows for use on either a soft or uneven surface for added convenience. It includes a built-in special function key for music volume control and slide shows, plus "home" and "search" capability. It is power charged by a USB and has a card slot for additional memory storage. 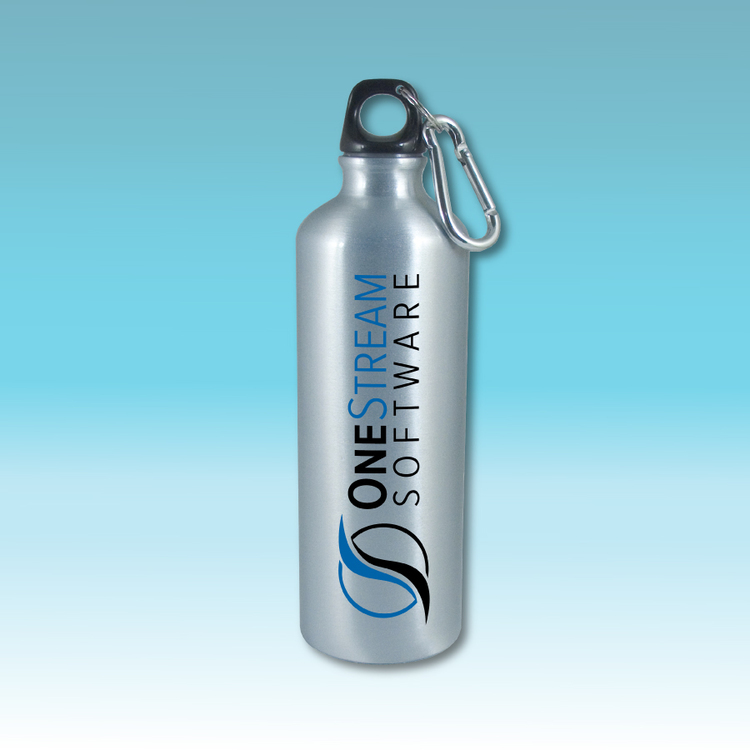 Customize with a brand logo and hand it out at the next tech event.